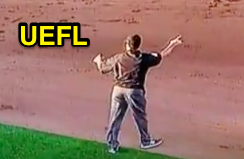 Baseball's intentional drop rule, third-cousin of the infield fly, found its way into Triple-A's All-Star Game Wednesday night as the Pacific Coast League attempted to turn a crafty double play, only to have "Time" called instead. PCL Ump Cunha calls a drop on the PCL team. The Play: With one out and two on (R1, R2) in the top of the 7th inning of the INTL-PCL affair, International League batter Chance Sisco hit a line drive to PCL second baseman Ildemaro Vargas, who momentarily caught the ball before it dropped to the infield dirt as IL baserunner R2 Rusney Castillo ran back to retouch second base. 2B Umpire Billy Cunha of the Pacific Coast League immediately called "Time," pointed toward first base, and signaled batter Sisco out on the caught line drive under the intentional drop rule. The Rule: Official Baseball Rule 5.09(a)(12) states that the batter is out when—"An infielder intentionally drops a fair fly ball or line drive, with first, first and second, first and third, or first, second and third base occupied before two are out. The ball is dead and runner or runners shall return to their original base or bases." The fielder is allowed to allow the ball to fall untouched, but is liable for an intentional drop if he makes contact with the fair fly ball or line drive before allowing it to fall. This rule is superseded by the infield fly rule, meaning that had batter Sisco hit a fly ball high in the air instead, such that infielder Vargas could have caught it with ordinary effort, and Vargas intentionally dropped the fly after letting it fall into his glove, the infield fly rule would be invoked: Sisco would be out, but the ball would remain live. Related Post: Bernier Burned by Baserunning on Pseudo Infield Fly [legally untouched drop] (7/24/13). Related Post: Infield Fly Rule Knowledge Costs Giants as Reds Turn Two [dropped infield fly] (7/4/13).